When Bev puts on her apron each day, she thinks about family and acknowledges the “kitchen angels” who are watching over her. You see, Bev’s interest in baking and cooking, along with her entrepreneurial spirit, are probably in the genes. Her grandmother (Annie Funk from Lucky Lake, Saskatchewan) had 11 children and was widowed at an early age when Bev’s mother (Lucille Larter from Kyle, Saskatchewan) was only 4 years old with one younger sibling. To support the large family and to supplement her income, Annie took in laundry and did home baking for people in Lucky Lake. After Annie passed away, a lightbulb went off for Lucille and the other siblings, who were often asked for their mother’s family recipes. They decided to create a cookbook as a memorial tribute to their mother. 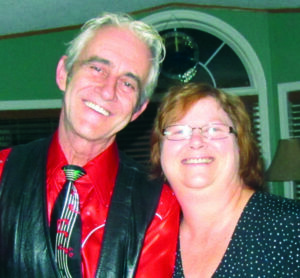 As a matter of fact, the book was so popular in the community and other small towns, there was a second printing –with many people buying more than one to give their own children as a treasured keepsake. Bev, of course, has a copy of the book and has referenced it numerous times during her 20+-year career in food service—working for resorts, restaurants, and caterers for many years. But, cooking for others was not enough. Bev had the itch to own her own business. In 2007 , she and a partner started Steam Weaver Coffees, a mobile specialty-coffee shop that has been a popular stop at many Vancouver Island special events, including the Vancouver Island MusicFest, Nautical Days and The Big Time Out. Seeing the popularity of some of the baked goods offered at Steam Weaver, a lightbulb went off for Bev, too. 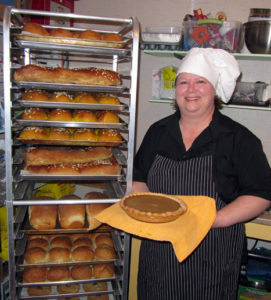 In December, 2009, Bev built her commercial bakery in Union Bay and opened Just Like Mom’s. Before she could even get business cards or labels printed, she started getting orders from local cafés and markets as soon as the owners of those establishments tasted samples. Bev also has a dream of doing her own cookbook when she’s not so busy baking. And, you can bet she’ll feature some of her family’s recipes, along with her mom’s beautiful artwork in it, just as she has one of Lucille’s paintings proudly displayed at Just Like Mom’s. We are in the news! Read about our April 2013 Vancouver Island Beyond Victoria! Also, April 2010 InFocus Magazine article, and our August 2010 Business Examiner article. Website Development by CAN Connect.